Thanks to the headline above, you probably expected to see a post full of bullet points, didn't you? Sorry to disappoint. So, where are the 10 reasons to love (or at least look forward to) Nintendo's next Kirby title that are promised in said header? Why, they're on the just-revealed cover art that will appear on each copy of Atsumete! 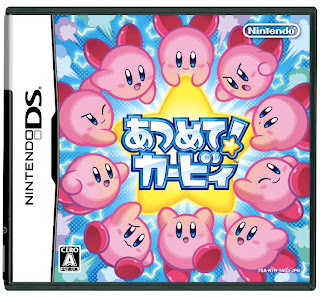 Kirby, a DS game that will be released in Japan this August. "Atsumete" apparently is Japanese for "gather," by the way. That certainly makes sense when you consider that the game "has players guide up to 10 Kirbys through a stage using the stylus," according to andriasang.com. 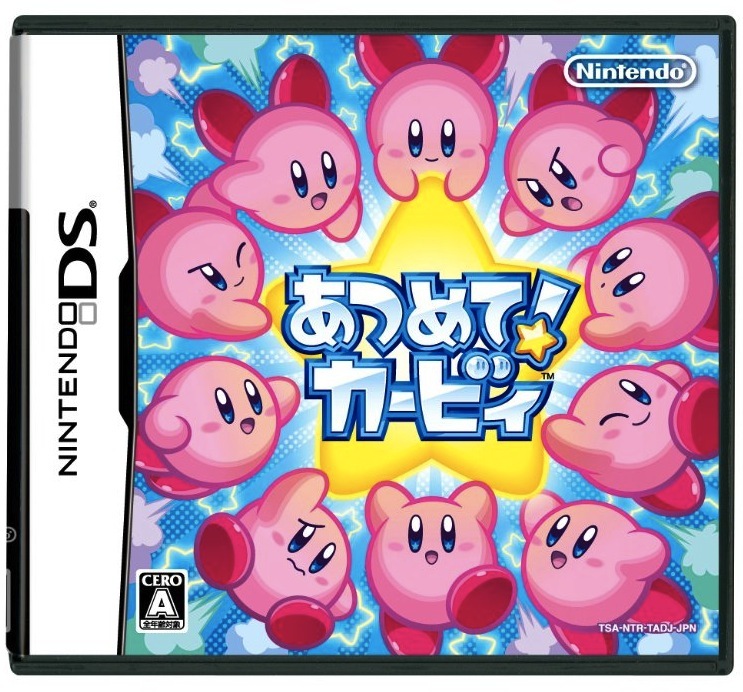 Every Kirby game except one (Kirby's Twinkling Kids, aka Kirby's Super Star Stacker) has made its way from Japan to the US thus far, so I have to imagine Atsumete! Kirby will follow in its predecessors' footsteps. Here's to hoping the art that graces the cover of the North American version of the game is as cute as its Japanese counterpart. If they don't release this game in NA, I'll send them a jar of my tears. Eww...that grossed me out. Moving on...the cover art is adorable, and they needn't change a THING. I agree on both counts, Justin -- that it had *better* be released in NA and that the folks at NOA needn't change anything about the cover. (Well, other than to translate the name of the game into English, of course.) Fingers crossed that it's announced during E3. I will definitely buy this! How would you make Kirby cuter? Put many Kirbys in the game! I love Kirby so much, I try to get all Kirby games. So far I've liked the DS titles pretty much as well. It's little of a shame though, I would love if they made a DS game inspired from the yarn theme in Epic yarn. But still, this is all good news! Holy S word that is ADORABLE! You know what they should have? Kirby marbles! Not so much glass, but like a smooth ceramic or something, and imagine how adorable it'd be to have two handfuls of Kirbys, each sporting it's own look or facial expression??? Pre-order bonus! Ha! I like your idea, J :) Maybe someone from Nintendo will read this (extremely doubtful) and put your idea into action. Thanks for the comments, by the way!